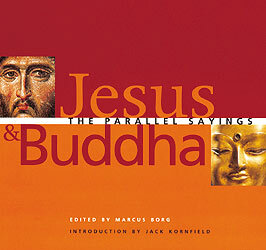 I recently got this wonderful book 'Jesus & Buddha: The Parallel Sayings', edited by Marcus Borg. It is a remarkable book and at the same time the experience that i had while buying it may be worth sharing here. The parallel sayings are really breathtaking. I will share them in this blog time to time. One day i was coming back from somewhere, saw this bookshop and went inside. There were lots of book as you can expect in any bookshop. While i was almost leaving empty hand, i saw this book. Its kind of those illustrative book printed on heavy art paper and comparatively expensive one. The kind that is not very suitable for a student like me to buy casually. It was 'good to hold and glance, but not good for the wallet' kind. Yet, somehow i had this strange feeling that its a book of special status and i need to buy it. and i did without much thinking. On my way back i was just looking at the intro section etc. I read this line, "You hold in your hand a remarkable and beautiful book." and these were the exact feelings that i had while i hold the book back at the shop, only difference is that the feelings don't have words. But they conveyed the same message. And i went on reading the introduction. Let me share some from there, "In our modern times we have had translated for us the teachings of all the world's major religions, the wisdom of ages. 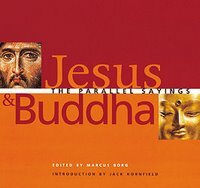 Jesus and Buddha, two of the greatest holy beings ever walk on earth, inspirations to billions, are now meeting in an encounter of the spirit in the West. When we listen deeply to their words, we find that in many ways, they speak with one heart. The brotherhood of these sacred pysicians, healers of the sorrows of humanity, was potrayed to me in a faraway land long ago. While studying Buddhism I had the privilage of visiting a monastery in the Mekong Delta of Vietnam. It was built on an island by a master of peace know as the Coconut Monk and filled with monks during the war years. Passing along the waterways in the midst of active fighting, our boat arrived at the dock where Buddhist monks greeted and escorted us around. They explained to us the teaching of nonviolence and forgiveness on which they had staked their lives. We ate together. Then then they took us to the end of the island where, on top of a hill, there was an enormous fifty foot tall statue of a standing Buddha. Next to Buddha stood an equally tall statue of Jesus. They had their arms around each others' shoulders, smiling. While helicopter gunships flew by overhead and the war raged around us, Buddha and Jesus stood there like brothers, expressing compassion and healing for all who would follow their way. ... What matters is not the scholarly or theological differences between Buddhism and Christianity, but that both offers direct teachings, instructions, practices, ways to conduct our lives and free our hearts. Jesus and Buddha say to us, even today, "Follow me." When i came upto the point where it says, Jesus and Buddha was standing having their arms around each others' shoulders, smiling ... i coulnd't help but was already crying. When i read, Jesus and Buddha say to us, even today, "Follow me." Do we dare? ... it occured as if i heard them saying, "follow me". I was overwhelmed. I was waiting at a bus stop with few ppl around me. i had to move away to hide and wipe the tears from my face. That line struck me so deep. As if i could see them standing on top of the hill, and i could feel the deep warmth of their heart with which they were having their arms around each others' shoulders, smiling.